It seems like Attack Values are being subtly lowered by WizKids in this set. There are a lot of 10 Attacks in this set where 11 seemed to be the norm for sets like Flash and Trinity War. Thankfully, they seem to be compensating for this by subtly ramping up the powers. For example, In another set I think AVAS007 Mettle would have just given AVAS006 Hazmat Mastermind and called it a day. Instead, in this set he actually teleports to her side from any distance whenever she is attacked to absorb damage for her. That’s a huge step up in effect. All of the Movie Avengers got both a regular version and an ultra powerful Chase version. Black Widow with Thor’s Hammer. Steve Rogers with a Nova helmet, Tony Stark with… armor so thick it doesn’t move around very well. Some of these ideas were better than others. 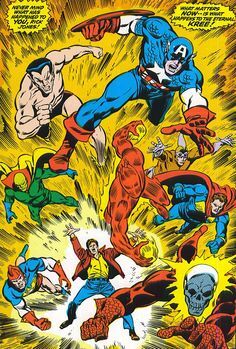 Not only were the new Cosmic Avengers underpowered for their cost, they were underpowered compared to what they do in the comics. 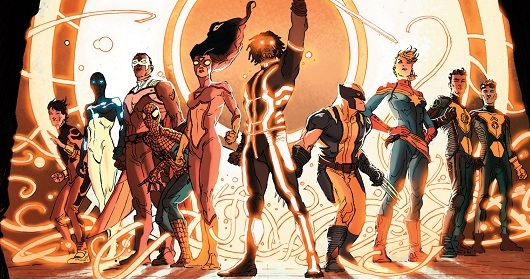 For example, in the comics, Star Brand knocked the Hulk into orbit and almost beat the rest of the Avengers roster combined (including Thor and Hyperion) by himself. In HeroClix Wiz Kids decided that amount of power translated into having a 10 attack and… 3 damage. 3 damage? Really WizKids? Really? 5. 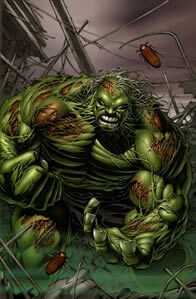 AVAS064E Hulk – He is the best No-Tactics 300 point one-man army in Modern Age. 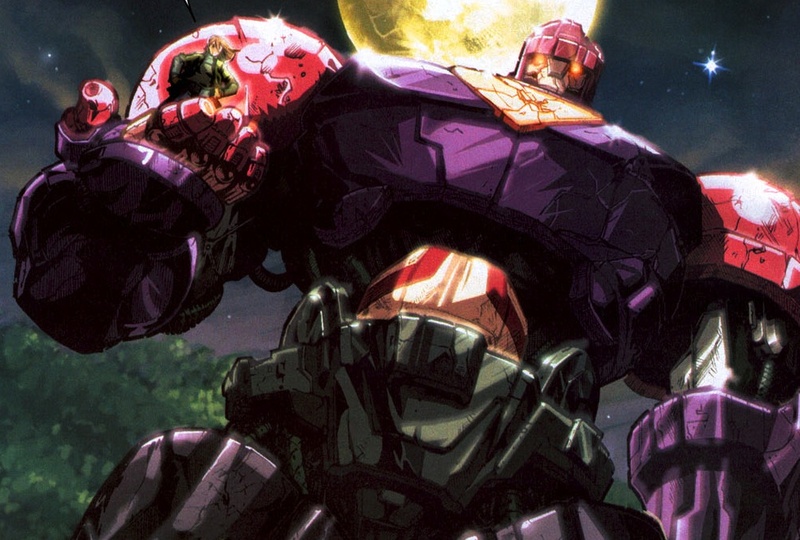 Rivaled possibly only by… himself (AAOU008 Hulk). While I think he would lose against his movie version one-on-one, I think the Hulk in Avengers Assemble would do better in a tournament for two very important reasons. First, his powers can’t be countered. Secondly, his Stop Click can’t be ignored by Pulse Wave. Add to that his Movement Special Power that lets you Charge 10 squares up a mountain while carrying an ultra heavy object, and this Hulk is really good at what every Hulk should be good at… Smashing! 4. AVAS010 Echo – I love figures with Super Senses and Shape Change. I tend to use those figures to tie up my opponent’s big hitter because no matter its Attack Value, those defenses will always be just as effective. So I love that Echo has has Super Senses and Traited Combat Reflexes and that in addition to those two powers she can copy a power, like, say, Shape Change, from someone on your team or even an opposing figure. Sure she can copy any Attack or Damage power (even Telekinesis, which is weird for that character), but copying Shape Change gives her a third defensive ability which is just awesome for a character under 100 points. Plus, unlike another recent, cheap defensive powerhouse (JLTW034 Element Woman), she actually has a decent offense. 11 attack (with her own Perplex) and Blades/Claws/Fangs. I’ll take that all day. Her downside is her lack of Willpower and the fact that while she has Stealth, she doesn’t ignore Hindering Terrain on movement. Both issues can generally be solved by a good taxi. 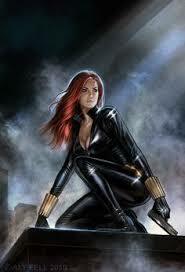 In a No-Tactics environment she’d do well with Chase AVAS065 Black Widow. 3. FFCA006R Captain America – Whenever I see a character cost 50 points, I know my writing partner Hypefox tends to pay attention. How he missed this guy I’ll never know. Didn’t he remember my Trinity War Top Ten Article where he said we’d be including Fast Forces figures in our Top Ten Lists from now on? 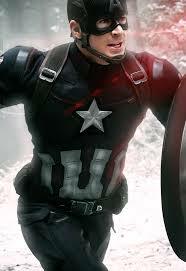 <Ahem> So, there isn’t too much to say about this version of Cap that isn’t obvious. His special power will let another Avenger move 4 or 5 squares without that figure taking an action and that can just be huge. But the real interesting thing about this guy is that he can do that from any distance. You can leave him in the (relative) safety of your starting area and he is just as effective. If you do want to bring him into battle, for 50 points his Precision Strike will give him a chance to hurt characters well above his point cost. 2. AVAS001 Black Widow – I love figures with Super Senses and Shape Change–did I mention that before? And Natasha’s Shape Change is especially good. It’s Traited so it can’t be Outwitted and if you hit make the roll then she can’t be attacked for the rest of the turn. She could have 5 other figures around her and they will just have to sit and stare at her. Making that roll a few turns in a row could be back breaking to your opponent in terms of lost actions. Her Damage Value is low for a Primary Attacker, but she makes a great Secondary Attacker on any team. Willpower, Stealth, Improved Movement, Perplex, Precision Strike… everything else you would want besides a high Damage Value. If you can compensate for that, then she will do quite well. 1. AVAS037 Manifold – He is the #1 best way to Carry around groups of Avengers, S.H.I.E.L.D or Hydra keyworded figures. Only a lack of willpower kept him out of my Top Ten. For more on this figure, see this article. 10. AVAS051 Red Wolf – Who is this guy? I have to say, I’ve read a lot of comics and I’ve never even heard of him. 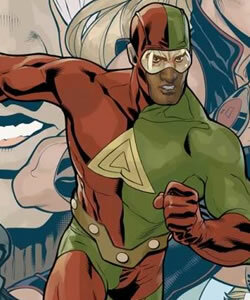 He has conditional willpower and good defense to go along with both Super Senses and Combat Reflexes. Which is okay as it is. But then I looked at his offense. In the right circumstances, this guy can deal more close combat damage than any Wolverine I’ve ever seen in HeroClix. Is that a wooden spear he’s holding, or a light saber? He can Flurry for two shots at 3 damage. 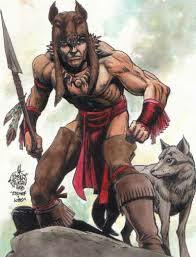 Then he can drop his pet, Lobo, who can attack with Blades/Claws/Fangs. That’s up to 12 damage without a critical hit or even using his Super Strength… and he’s only 80 points! Did this guy beat up Odin in the comics and I just missed reading that issue? 9. AVAS050E Iron Man – Even in today’s game, 18 defense with Defend in nothing to sneeze at. It was good when they released CT043 Invisible Girl and it’s still good now. 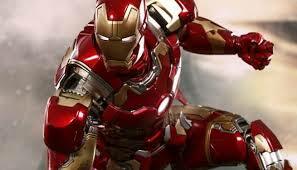 Add to that fact that any adjacent Avenger also gets Defend and you’ve got two ways to exploit Iron Man’s Trait. He could Carry around pieces with Combat Reflexes or Energy Shield/Deflection–AVAS049E Captain America is a great example of that. Or, he Carry Avengers that have the Tiny combat symbol and have a Defense Value higher than 18 like FFCA002R Wasp. Beyond his Defend tricks, this Iron Man also packs 4 damage, Hypersonic Speed, Indomitable, Invincible, and Ranged Combat Expert. He could fly in to punch an opposing figure and land one square away while dropping a figure like AVAS010 Echo to tie up the figure he just smashed. Then, the following turn, he can follow up with an Ranged Combat Expert attack for big damage. Always use your Hypersonic Speed to strike and then leave him behind the rest of your team. He doesn’t take a hit very well at the 125 point level. Something else that lead to his high placement on this list is that at his 125 point level he makes a great ID card call in figure–especially at the end of his dial. 8. AVAS048 Trick Shot – Compare him to DP036 Bullseye and I think he’ll compare favorably. We all remember how good Bullseye was when the Deadpool set came out. Trick Shot is 6 points cheaper and has much better defensive powers. Instead of Bullseye’s Probability Control, Barney Barton gets Stealth and Shape Change, which means he ends a lot of strikebacks before they begin. 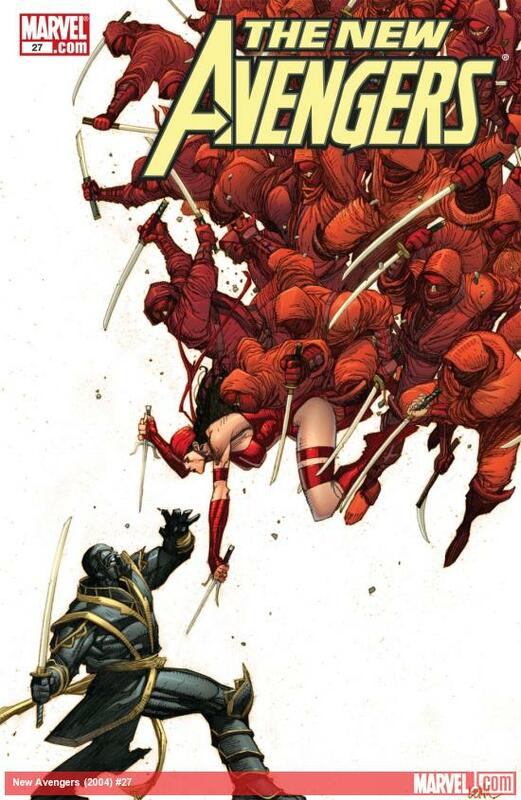 But, even better then comparing the two, play them together–they share two named keywords (Dark Avengers and Thunderbolts, the latter of which opens up all kinds of possibilities). Any opposing figure will be full of holes before they even know what’s happening. 7. 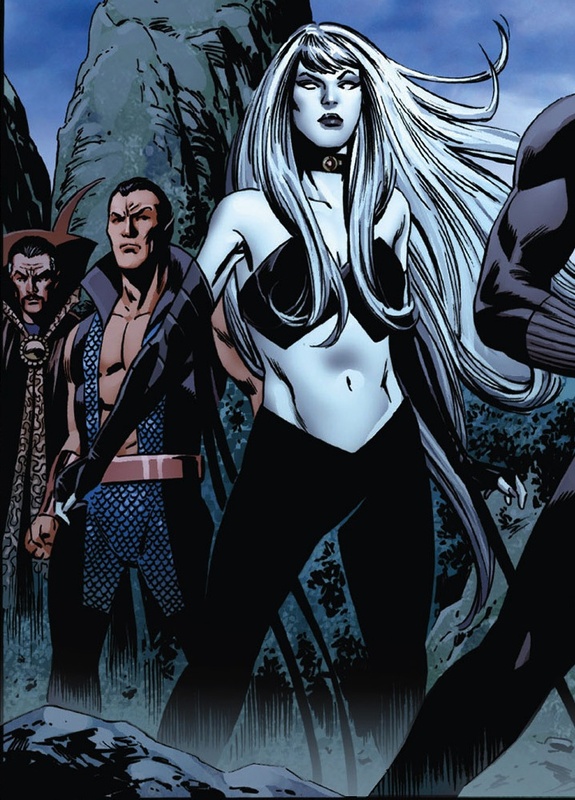 AVAS045 Black Swan – Probably the coolest new character to be introduced in the last few years. She has also been given one of the coolest dials in her point range. Her opening movement power states, “HURRY TO EACH THREATENED WORLD: Black Swan can use Phasing/Teleport. When she does, after actions resolve she can make a close combat attack as a free action.” This means she can move up to 10 squares through buildings, mountains, water, or whatever else is in your way and still make an attack by dropping an ultra heavy on someone’s head for 7 damage! When she gets targeted by opposing teams she has Invincible, which eventually turns into Impervious. And remember, her powers can’t be countered thanks to her Power Cosmic Team Ability. However, the power that has everyone excited about her is “YOU HAVE FAILED TO STOP THE INCURSION: Unless this click is revealed due to taking damage from an opposing character, immediately deal Black Swan 1 unavoidable damage. At the beginning of your turn, if Black Swan is the only character on your force, KO all opposing characters. This power can’t be ignored.” As of yet, no one has thought of a way to get around the formidable restriction on that power and activate it on a less random basis, but people are working on it. In the mean time, I like to think of it a nice bonus on an already efficient figure. 6. 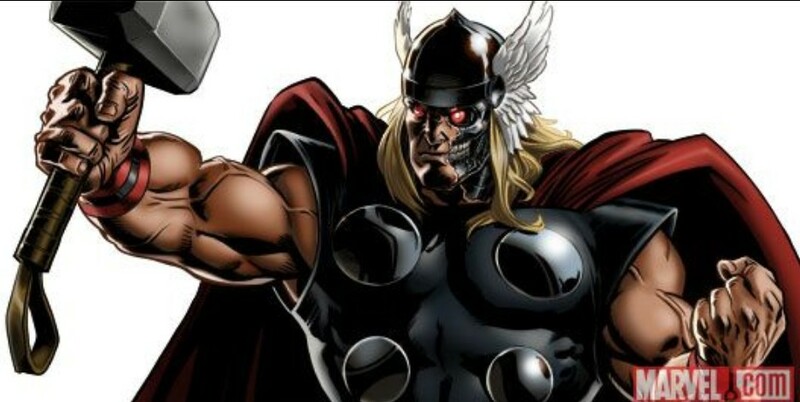 AVAS053B Ragnarok – Marvel’s Thor/Terminator combo character. For 200 points you get a ranged Primary Attacker with all of the attributes you’d want. 12 attack, 5 damage, Indomitable, Impervious, Shape Change and Running Shot. You get great stats and great powers for a bargain price. Being Outwittable is really his only true weakness. This best part of his dial isn’t even anything I’ve mentioned above, It’s his keywords. Specifically the “Robot” keyword. They got a huge boost this set (more on that later). Ragnarok may the best character in Modern with that keyword. Which means you’re going to be seeing him a lot. 5. AVAS052 Ronin – This spot on my list was going to be either Ronin or AVAS066 Goliath. I ended up going with Ronin. Here’s why. If either figure needs to make a ranged combat attack, they both will likely turn into AAOU009 Hawkeye. So that’s even, or even a little slanted to Goliath due to the heal when replacing to Hawkeye. But, If Ronin or Goliath were to be in a close combat battle then I would rather have Ronin (or even Echo), hands down. Another thing to keep in mind is that compared to the Stealthy Ronin, Goliath is a Giant-symbol-ed target when moving across the board. Ronin brings to the table Charge, Blades/Claws/Fangs and either Exploit Weakness or Flurry depending on what the situation demands. That’s some high powered offense for only 109 points. Later in the dial Ronin also has some nice Outwit. Also, until set retirement later this year he can change into Blade from Amazing Spider-Man and use Regeneration if he has taken too much damage. That’s another option Goliath doesn’t have. 4. AVAS067 Rick Jones – This spot on my list was going to be either Rick Jones or AVAS047 Master Pandemonium. Even though Master Pandemonium was the king of sealed at my local venue, I went with Rick Jones due to his much lower point cost and the fact that Rick doesn’t have to use a power action to resummon his Bystander Tokens when they are destroyed. What Rick Jones brings to the table for 75 points is 10 range and three bolts (wow!) with Telekinesis, Psychic Blast, Mind Control, Perplex, a 19 Defense from ranged attacks, an 11 Attack Value and a never ending stream of his own personal tie up Bystander Tokens. 3. AVAS046R Loki – 120 points of Asgardian support figure with no Willpower or damage reducers or move-and-attack and a starting damage of two? Why do I like him again? Because he is awesome. To be more specific, he’s the best defensive character in this set, and sometimes, the best offense is a good defense–especially if that defense makes your opponent waste turns. 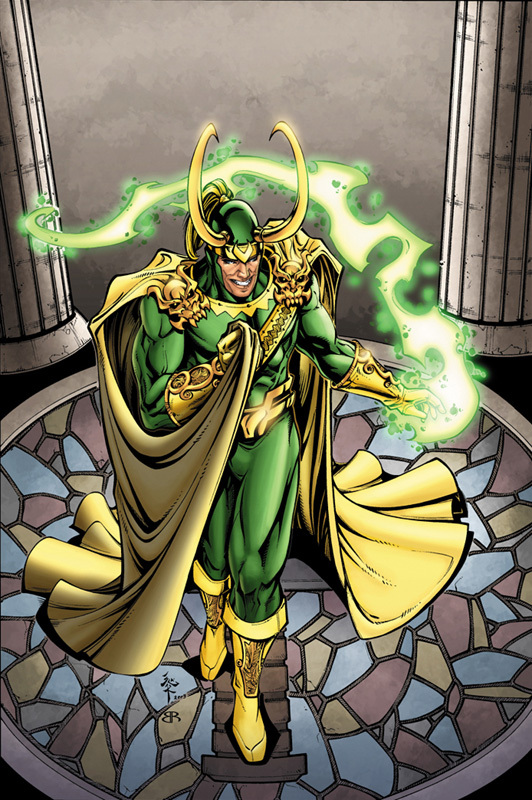 His Trait reads, “MASTER OF ILLUSIONS AND TRICKERY: Loki can use Shape Change and succeeds on a result of 4-6. 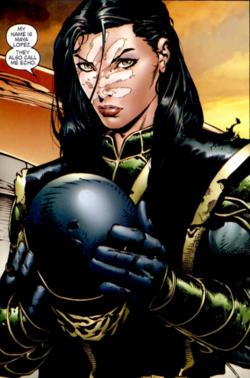 When an opposing character targets Loki with Outwit or Perplex, he can use Shape Change as if he were targeted with an attack. When Loki makes a successful Shape Change roll, he can’t be targeted for the remainder of the turn.” So Loki is just waiting for an excuse to shut down your opponent’s attacks against him this turn. You could try to Outwit his Super Senses or Perplex down his defense, but you’d be stupid to do so. That Perplex or Outwit might shut down your attack before you even declare one! Offensively his damage is low, but you probably won’t be making many standard attacks. 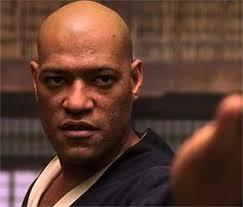 His Mind Control Special Power reads, “TO TRICK MY BROTHER…AND HIS FRIENDS: Loki can use Mind Control. When he does, he isn’t dealt damage from it and, if he targets only a single character, modify Loki’s attack value by +2 and he may target a character that can use Battle Fury.” He has double targets, 8 range, 13 attack (with the bonus) and he can use that to Mind Control pretty much any piece(s) in the game–2 at a time–without taking feedback damage for it! When your opponent only has one piece left on his team, then you can feel free to go and Poison him. Which means you have 17 Points left to add in whatever Bystander tokens or Resource pieces you want. Hammers would be fun. But the funnest part of this Build is watching your opponent’s attacks do absolutely nothing turn after turn. You can work him into the old Blue Battery team with Superior Spider-Man (you’d be taking out Captain Marvel and some Constructs). Give Superior Spidey the Decoy and Loki the Net and just have fun with your opponent finally hitting only to have the Blue Emotional Spectrum Power take it away again. 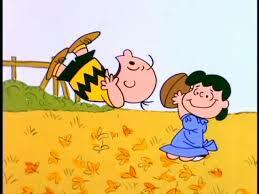 I call it my “Charlie Brown and Lucy Kicking the Football” team. Feel free to call your opponent a “Blockhead”. Click here to see more info about using Superior Spider-Man and the blue battery. 2. AVAS020 Juston Seyfert – Okay, so, everyone remembers GG026 Mole Man and what he did for monsters. Well he and his three similar friends DP043 Black Talon, GOTG003 Mantis, and IIM015 Tony Stark all share a similar power. They can all Mind Control certain types of friendly figures and, if they make the Mind Control roll, assign that figure one action. When WizKids made Juston Seyfert, they made him similar to those other guys except THERE IS NO ROLL REQUIRED AND ZERO CHANCE OF FAILURE!! And the cost to activate–a Power Action for Juston or a Close or Ranged Combat Action for the others–is exactly the same!! That alone makes him better than all of those other guys I mentioned. At 40 points he is also cheaper, too! Then, just to add insult to injury, they let Justin give any Robot a full move AND a close or ranged combat attack all with one action. That is two actions instead of the one that everyone else ever made like him before gets. That’s not power creep, that’s a power leap! If you want team ideas go to the HCrealms units section and get a list of every robot in Modern with a point value between 140 and 260. They are now suddenly all tournament viable. All of them. You don’t even have to try and pick a good one. Honestly, sometimes it’s funner if you pick a crappy one–it stings your opponent more when you win. Expect to see Juston on Top 8 army lists until he is retired. 1. AVAS013B 3-D Man – For 90 points you get a Hypersonic piece with 9 movement, 11 Attack, 18 Defense, and 3 Damage. Those are pretty good stats for that point level. He’s missing Willpower, but what he does have is the game’s first Perplex that can be used three times! Even the ASMS102 Dr. Octopus Arms Relic only lets you use Perplex twice! The drawback is that he can only target himself and that Outwit ruins his day. The good news is that with his 9 Movement, often times he can strike before your opponent can get within Outwit range. This gives him some incredible utility. For example, you can increase your Damage by one and Movement by 2 and then suddenly you’ll have a near carbon copy of the 110 point FL037B Dark Flash Prime! Or you could add +1 to Damage and +2 to Attack and land a massive 13 attack 4 damage Hypersonic blow. Or you can do what I would likely do all game and just Perplex his defense to 21… every… single… turn! That’s a 90 point character that can get to a the highest Defense Value that has ever been printed on any HeroClix figure ever. The Spectre, Galactus, and Dr. Manhatten all seem like great company to be in for a 90 point character! That is a plethora of effects for a 5 point investment and that’s why he is the best figure in the Avengers Assembled set. Agree? Disagree? Sound off in the Comments section below! 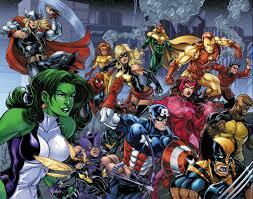 ← Comics & More Local Tournament Report for 06/10/2015: Age of Ultron SLOP: Month One: Electric Bugaloo! !